Nepal has huge tourism potential which is evident from numerous accolades it has received over the years, some of which includes wanderlust Travel Awards 2001 in UK.Tourism is the world fasted growing industry and being one of the hottest economic activities, Leisure recreation is popular all over the world. Nepal is recognized as a tourist destination place because of its unique nature and, besides cultural heritage and religious/traditional practices. Historical monuments and the sites of pilgrimages are sure to motivate tourist to visit Nepal at least once in lifetime. Hiking in Nepal .The art and architecture, ethnicity, tradition and custom of the people are there to see while feeling the hospitality and warmth of the people in this friendly atmosphere of Nepal. Everest .The foot trail, the country sides views, the highlands and lowlands hills and plains, the green forests, the magnificent rivers, Ice-capped Himalayas, diverse group of flora and faunas are not to be missed by anyone who travel in Nepal with lot of expectations. This trade creates many favorable multiplier effects in private sector like foreign currencies earning, employment generations, change in social cultural and traditional structure, change in life style, upgrading living standard and so on. Nepal is culturally, naturally and geographically rich country. To feel its diversity, high mountains and low hills, Rural peoples and their life styles, Tourists are coming in Nepal when its door opened in the year 1950.Nepal is popular destination for trekking, Rafting and canoeing, Rock climbing, Hiking, Mountain Biking, Jungle Safari, Bird watching, Mountain flight, Ultra Light Aircraft, Bungee Jumping, Paragliding and other activities. People from the world come here for different goals and objectives. Some are coming for spending their holiday for enjoys and some are coming for their special study regarding the academic experience qualification like PHD. 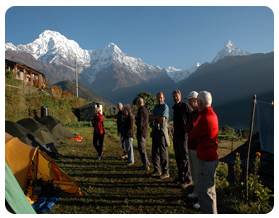 Trekking is one of the very popular and adventure activities in Nepal. The high passes with breath taking places and different climates give the new test to people. International tourism has its own significance however, Internal tourism development is also equally important for revenue generation and creation of employment opportunities at village level. 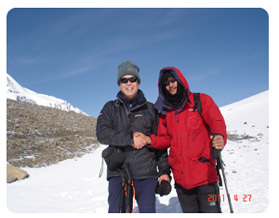 Trekking is very popular for hill and mountain region. Tour in Nepal Green hills, snow capped mountains, Tars, Valleys, Byansis, lakes, water falls etc are the main geographical attraction for the tourist. To know about these things people needs good education trainings, skills and practice for its people in Nepal . Nepal Trek strategy. Horse riding, camping are finding help to understand the uniqueness of Nepal's hotels Asia tourism and global significance of the Eco-tourism resources in the country. For these cases should manage the comfortable lodges and hotel accommodations in particular places and other facilities from the government level. base camp Adventure The program of awareness for rural people and their participator are primarily very important to civilize the country. The concept of Legal Education Training Home Pvt.Ltd is derived to promote and development especially Travel, Tour and Trekking in Nepal, Besides of them various training for poor and rural people of Nepal who want study abroad, Free counseling, all kinds of Legal documentation and other essential ideas giving by well foreign languages, computer, Cook, waiter, captain, security guard and other trainings with latest technologies. Nepal is land Locked country and captivated the imagination of mountaineers, explorers and extra ordinary in the world with contained some of the most breath takingly beautiful mountain scenery's, priceless natural resources, mysterious cultures and religions, different types of people have shaped the philosophical outlook of the civilized world for the thousand of years. To introduce and expand these all are duties of its people. Henceforth Legal Education Training Home Pvt. Ltd is established on 13th dec.2009.It is multipurpose trading company under the Nepal government company Act 2006.